﻿Sketching, every time! I'm not much of a sports fan, but I did Tivo the game and watched it after I got home. Today was the Big Game (Seahawks won the NFC Championship in a home game!). First, I arrived at the Park and Ride for the light rail station early so as to get a spot. I learned from previous experience that it fills up early with fans. 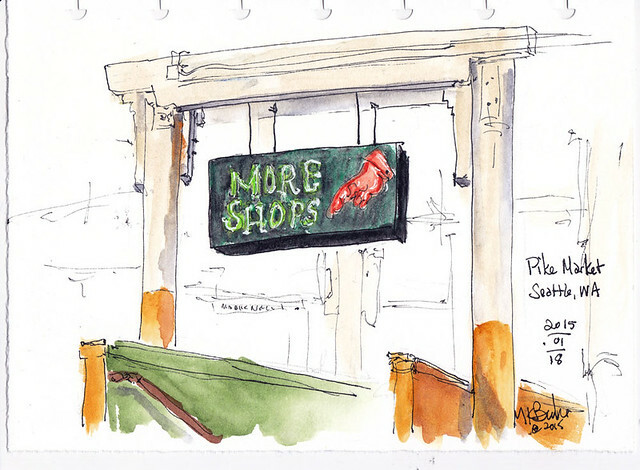 As a result, I was at Pike Market far earlier than I needed to be for the Urban Sketchers Seattle monthly outing. 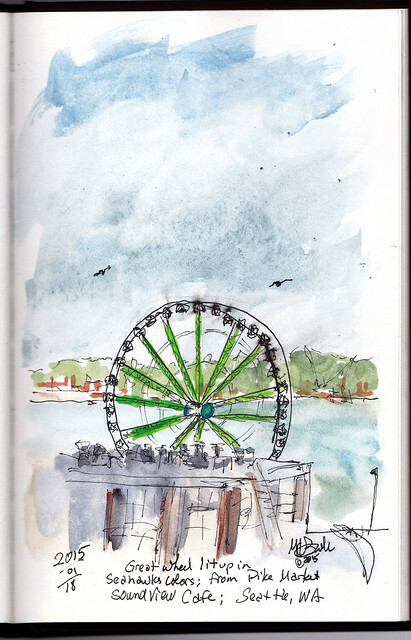 I had breakfast with a view of the Great Wheel, lit up in Seahawks colors. I wasn't sure how many people would attend due to said Big Game. But we had a goodly number. We took a "before" group photo as a few were leaving early to watch the game. 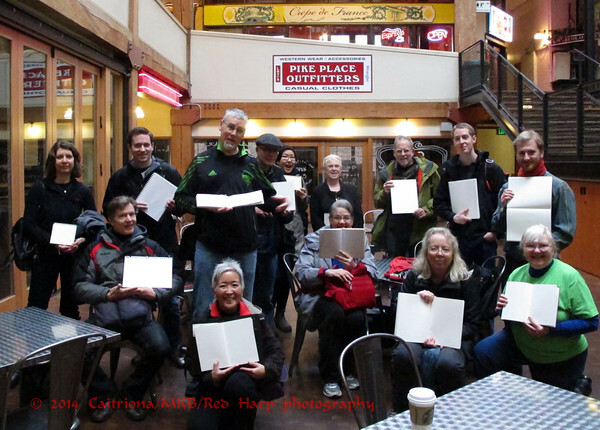 You might note everyone is showing a blank sketchbook. 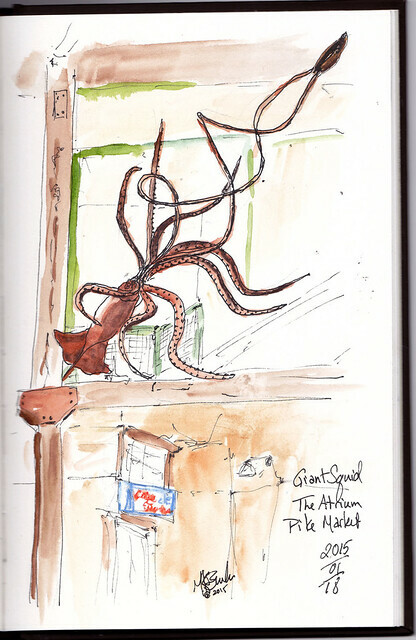 My intention from the beginning was to sketch the Giant Squid sculpture hanging from the 2 story atrium. After that, I wandered around looking for another sketch. 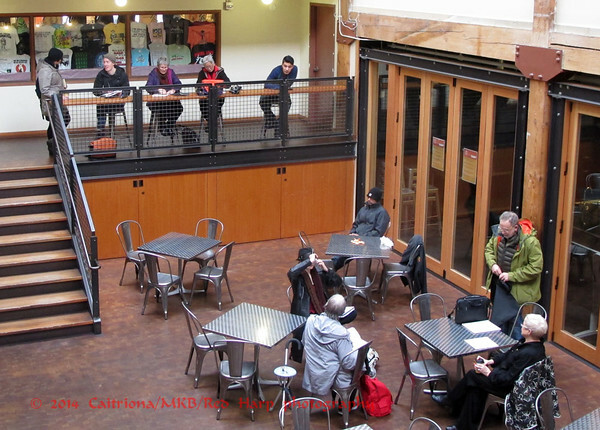 At one point, it was raining so hard I wondered what all the racket was... it was the rain on the Atrium roof! So no going outside around the Market. I finally settled on one of the iconic Market neon signs. 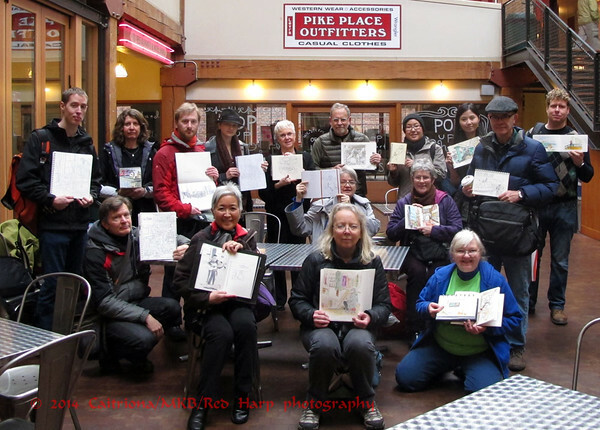 Sketchers had gradually gathered back in the Atrium, where we shared out sketches and had a final group photo. 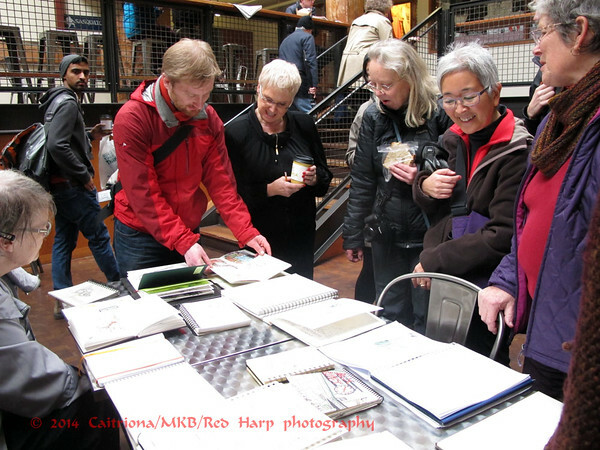 Several new people joined us today. I'm sorry we didn't do another round of introductions at the end. Wonderful sketches -- I especially like the squid, such a tricky subject handled with aplomb! Thank you for making a newbie feel welcome, it was great fun and I hope to do it again. Great idea to do two photos! i love how flexible Usk can be. I also especially like your squid.